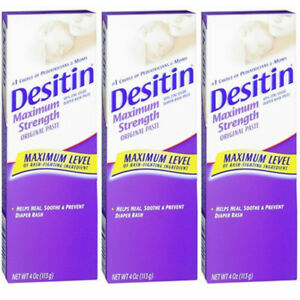 The original maximum strength of Desitin Diaper Rash Paste soothes sore behinds and heals rashes. With 40 percent zinc oxide as the active ingredient, the paste seals out moisture through multiple diaper changes. While it creates a thorough skin barrier, it also softens and hydrates skin with petrolatum, lanolin, beeswax, and glycerin. Desitin is designed to provide fast relief within the first 12 hours following application. The paste should be put on areas of soreness liberally to provide effective protection.